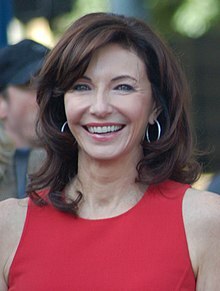 مری استینبورقن (اینگیلیسجه: Mary Steenburgen) آمریکالی اوْیونچو ۱۹۷۸–گۆنوموز ایللر آراسیندا سینما ساحه‌سینده چالیشیب. 1983 Faerie Tale Theatre Mary / Little Red Riding Hood Episode: "Little Red Riding Hood"
1995 Frasier Marjorie (voice) Episode: "Retirement Is Murder"
2002 Law & Order: Special Victims Unit Grace Rinato Episode: "Denial"
2004 Becker Patient Episode: "DNR"
2011 Robot Chicken Athena (voice) Episode: "The Core, the Thief, His Wife and Her Lover"
2017 Finding Your Roots Herself Episode: "Puritans and Pioneers"
2018 The Conners Marcy Bellinger Episode: "Keep on Truckin'"
In addition to these recognitions, Steenburgen received the 1,337th star on Hollywood Walk of Fame on December 16, 2009. اینگیلیسجه ویکی‌پدیاسی‌نین ایشلدنلری طرفیندن یارانمیش«Mary Steenburgen»، مقاله‌سیندن گؤتورولوبدور. ( ۲۱ دسامبر ۲۰۱۷ تاریخینده یوْخلانیلیبدیر). قارداش پروژه‌لرده مری استینبورقن گؤره داها آرتیق بیلگی‌لر تاپابیلرسینیز. بۇ صفحه‌‌ سوْن دفعه ‏۱۳ مارس ۲۰۱۹، ‏۱۳:۰۵ تاریخینده دَییشدیریلمیشدیر.